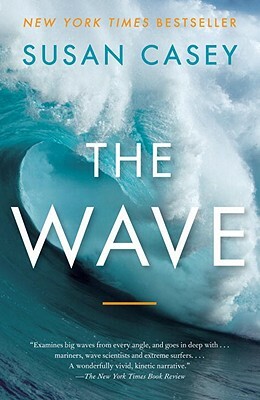 I can't say enough about this exciting read, Susan Casey weaves the research she did into the science of waves with the companionship and thrills she found following around big wave surfer Laird Hamilton and his gang who live in Hawaii but surf wherever the waves are. Like fellow non-fiction writer Bill Bryson, Casey knows how to keep the narrative going and will have you on the edge of you seat till the end of the ride. In her astonishing new book Susan Casey captures colossal, ship-swallowing waves, and the surfers and scientists who seek them out. For legendary surfer Laird Hamilton, hundred foot waves represent the ultimate challenge. As Susan Casey travels the globe, hunting these monsters of the ocean with Hamilton’s crew, she witnesses first-hand the life or death stakes, the glory, and the mystery of impossibly mammoth waves. Yet for the scientists who study them, these waves represent something truly scary brewing in the planet’s waters. With inexorable verve, The Wave brilliantly portrays human beings confronting nature at its most ferocious. Susan Casey, author of New York Times bestseller The Devil’s Teeth: A True Story of Obsession and Survival Among America’s Great White Sharks, is editor in chief of O, The Oprah Magazine. She is a National Magazine Award-winning journalist whose work has been featured in the Best American Science and Nature Writing, Best American Sports Writing, and Best American Magazine Writing anthologies; and has appeared in Esquire, Sports Illustrated, Fortune, Outside, and National Geographic. Casey lives in New York City and Maui.